with thinly potted flaring sides divided into five petal-lobes by deep indentions on the exterior rising to high points around the interior rim, the plain center enclosed by a recessed ring border corresponding to the turn of the base on the underside, covered all over with a transparent glaze which gathers in characteristic "tear-marks" of ivory tone on the underside, the ring foot with unglazed edge showing the fine white porcelain body, with some kiln grit adhering to the inside of the foot rim, the flat base incised through the glaze before firing with the character guan. 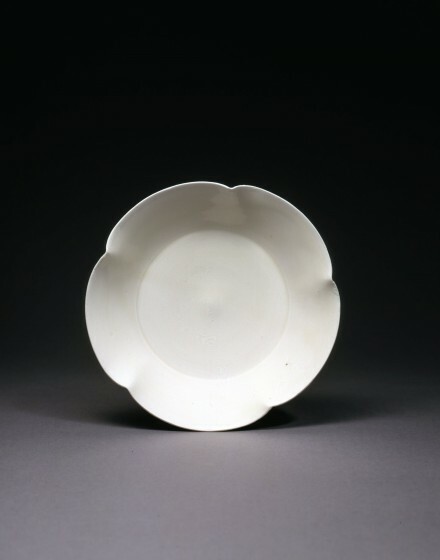 Compare the white porcelain dish in the shape of a five-petaled flower, also inscribed on the base with the character guan, which was excavated in 1985 in a hoard of thirty-three white porcelains attributed to the Tang dynasty discovered at Huoshaobi in the northern suburbs of Xi'an, Shaanxi province, now in the collection of the Xi'an Bureau of Cultural Relics and Gardens, illustrated in Treasures: 300 Best Excavated Antiquities from China, Beijing, 1992, p. 241, no. 225. 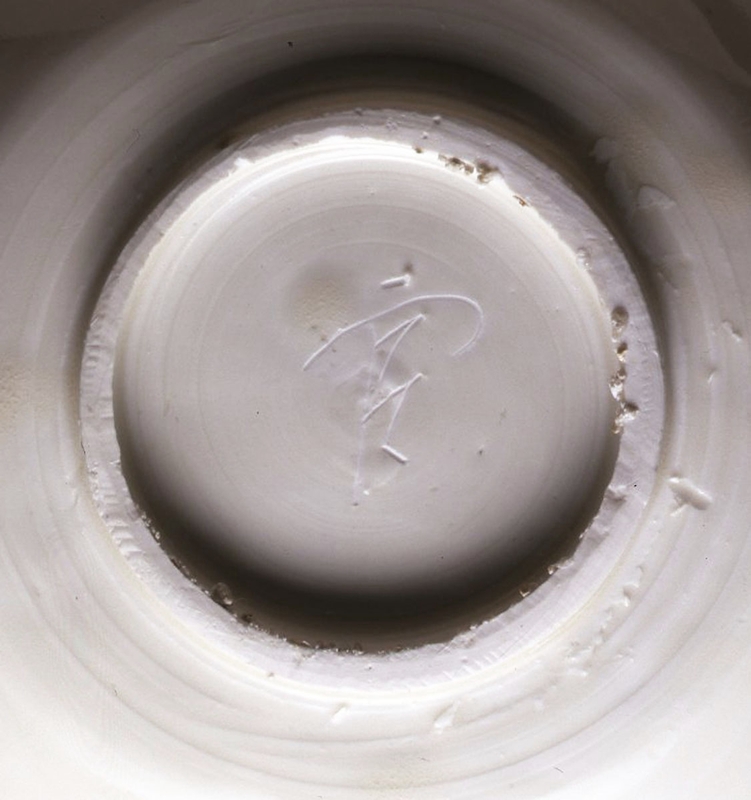 White porcelains inscribed with the character guan have been excavated in various Chinese provinces at sites dated to the Tang, Five Dynasties, Liao and Song periods. There is not yet any clear documentation to explain the origins of the mark, but scholars generally agree that beginning in the Tang dynasty white wares were presented as tribute items for the imperial court, and the association of these wares with the Tang imperial court has been confirmed by the evidence of sherds of white porcelain excavated at the Tang dynasty site of the Daming Palace at Beimenwai, Xi'an. Other white porcelains bearing guan marks have been excavated from underground treasuries buried as part of the dedication ceremonies at Buddhist temples during the 10th and 11th centuries, indicating that the precious quality and prestigious status of guan-marked white porcelains continued over a long period and extended beyond the imperial court. For a comprehensive report on guan-marked white porcelains see “The Origin of High-Fired White Wares with Incised Characters guan and xin guan” by Li Huibing, in Wenwu, 1984, No. 12, pp. 58-63.